brookeflyfish16 – Fishing Mom Extraordinaire? I am lucky enough to work in the fly fishing industry, as an owner of The Angling Bookstore and Project Coordinator of the Women's Fly Fishing Showcase at the Denver & Somerset Fly Fishing Shows. I get out on the water during the summer months in Colorado and as often as possible in the salt flats of Mexico and Belize. Back East, we fish in Pennsylvania when we go "home" for PSU football games and out West, we like to fish the Olympic Peninsula. These days, I spend a lot more time adventuring in the outdoors with my toddler...who loves the fresh air, cool breeze and endless discovery of the wilderness just as much as his dad and I. Like everyone else, I am in constant search of the impeccable balance of work and home life. Home wins, bar none, 99% of the time. And that's okay with me. The title of this entry reflects a bit of transition. The last 10+ days were marked by a contagious disease that took over our household and led to sleepless nights (and mornings), bribes of vanilla ice cream and chocolate milkshakes as early as 5:45am and as late as 9pm, uneaten fruit accumulating layers of mold, and half a dozen packs of Ramen. We’ve watched more episodes of Dinosaur Train than we care to admit. There were moments when I feared my two year old had grotesquely turned into “that” toddler- who could not be appeased by any effort we were willing to put forth. “What will I do if he throws a fit like this outside our house?” became a recurring thought in my head. I learned a little bit more about how much each person in our family could “take” before breaking. Yesterday I could feel that the plague which had befallen our household was finally lifting. We recovered from the Super Moon do its eclipsing thing, and were finally feeling hopeful about the range of possibilities a new moon can bring. The seasonable autumn brown overtaking our landscape will soon be followed by lots of white stuff which will later feed the waters we treasure so much. We caught the last Farmers Market- where beautiful root vegetables were in abundance. We captured a few hours in the sun- the last of which was spent jumping in the leaves at the neighborhood playground with a crew of excitable children. I got a few loads of laundry out on the line- the sun was bright enough and certainly the wind was strong enough to dry (and decontaminate) our sheets and clothes quickly and efficiently. I talked to my son about going to the hospital on Monday- for a lump in my breast. He cocked his head to the side and said, “Are you sad?” I replied, “Yes, I am a little sad.” “Let me hug you,” and he reached his arms out, wrapped them around me so lovingly that I knew everything was going to be okay. “Don’t be sad. You feel better now.” He wasn’t “that” toddler; he was still my sweet, caring little boy. Whooh! Today, I am grateful for many things. I am grateful that the “lump” was nothing more dense breast tissue. I am grateful that my husband got a whole day out on the water yesterday, catching his biggest rainbow of the season with a new fly fishing companion who rows like a champ. I am grateful that my parents are arriving in two days and my son could not be more excited. I am grateful that our neighbors graciously welcome my folks to rent their house because they’ve moved back to Wisconsin for the winter (yea, figure that one out). And I am grateful that I know the pleasure of doing laundry on the line rather than in the dryer. Why don’t more people do this?! Seems like a no-brainer to me. FREE DRYING! There is nothing like wrapping your pillow in a pillowcase that hung in the Colorado sun all day long. There is a smell that cannot be imitated, a freshness that cannot be captured with words, and a comfort that is completely unmatched. The moment I laid my head down last night, I knew today would be a great day. We are still dealing with a very early riser (5:45am) but he is back to his healthy, happy self. We have another month to get the laundry out on the line without having to post-hole through the snow. And, for a few more weeks, we will do just as Dinousaur Train’s Dr. Scott the paleontologist suggests…we will “Get outside, explore nature and make (our) own discoveries.” More than anything, I hope to find grace in every moment- whether it is seemingly good or bad at the time. In the last few weeks, I have been all over the place with the amount of time I am putting into my work. I go through waves of being able to really focus, check things off my list and feel like I am on top of my game. It feels so good when I make a few sales, send out a few emails and get some posts scheduled in advance. I generate some ideas, share them with colleagues and take one more step towards making the kind of progress I am looking for. Then the kid gets sick for a week. Suddenly, he is not going to school, I am not going to the office, I am not sleeping, I am fighting with my entire immune system while learning the lengths of my patience, understanding and compassion with a miserable toddler who (when he is sick) runs my life. With some family coming into town next week, I know that every minute of work I can squeeze in will count in the long run. So, while my hand, foot and mouth diseased kid takes an evening nap (afternote- we let him sleep through the night) while listening to Mozart and Bach- (OVER, AND OVER AND OVER AGAIN), I am listening to the Ziggy Marley station on Pandora and feeling grateful. I wanted to flesh out a few thoughts on the Sponsors and Presenters who have agreed to collaborate in preparation for the 2016 Showcase. It wasn’t surprising when Whitney Milhoan, Executive Director of Casting for Recovery, mentioned that she was good friends with Jen Ripple. Casting for Recovery is responsible for taking thousands of breast cancer survivors on fly fishing retreats all over the country. Whitney and I had a great conversation about the issue of retention in her organization and across the nation in women’s organizations, alumni groups, conservation non-profits. Retention is going to be good for the entire industry and I look forward to a packed room for the roundtable discussions on retention at both showcase locations. Oh, and I have Cathi Comar from The American Museum of Fly Fishing to thank for her electronic introduction to Whitney. The International Federation of Fly Fishers has come on strong for 2016, thanks to Rhonda Sellers. Peggy Brenner pointed me in their direction because of their success in the Women’s University. IFFF has provided a learning Center at the Shows for more years than I have fingers, and I have no doubt that this collaboration will continue for many more years. I hope to make the connection between IFFF and Girl Scouts this year…creative juices are flowing! Sisters on the Fly has had a presence, and I mean a PRESENCE, at multiple locations on the Fly Fishing Show tour over the years. Their group has single-handedly become the largest women’s organization in the country- all designed around the theme of “We have more fun than anyone.” Their members do have a a lot of fun, but they are also very committed to women getting outdoors. Maurri Sussman and her son, Austin, are a force to be reckoned with, and I am beyond stoked that they will be joining us in Somerset – albeit, without their trailers this year. Blue Halo Gear is getting ready to launch a new rod and a new non-profit relationship benefiting women, and just yesterday decided to sponsor both locations. Blue Halo speaks women, and I can’t wait to see how many fiberglass rods they sell through their relationship with us! And then there are the presenters- and brainstormers! I’ve talked to female guides who are fulfilling their bliss, as well as those who are fighting for equality and respect on their homewaters, just like spawning fish heading upstream. I am having conversations with Girl Scout leaders about getting more Brownies and Cadettes to the Shows to earn a patch that is being donated by my good friend, Vann Taylor. I am also having great conversations with folks and business representatives who want to learn more about the Showcase and see if sponsorship or partnership is a good fit for them. A shop owner asked for hard numbers on what women spend in the fly fishing industry. #1- These numbers don’t exist. #2- How do I respond to “We already have waders and boots. All other equipment is gender neutral. Doesn’t everyone wanted to be treated equally.” #3- I love these kind of tough questions and discussions…ones that lead me to look really hard at how we can facilitate dialog between female anglers, shops and industry reps so that we get on the same page about what women are looking for from the industry. In the meantime, I am scouring the OIWC to learn more about women’s role in the outdoor industry, as well as how their organization works with corporations to “elevate” women, (AND why fly fishing is poorly represented in the OIWC- a fact I would like to improve). This year, after launching their rods based on the premise there was not only a lack of products made for women but also for lack of respect given to women for their skills, passion and love of the sport, Sara Bella decided it was time to get on the Show floor. As a fellow exhibitor, I know what that takes and I have no doubt that Sara Bella will grow as they continue their relationship with our Show. It has also brought me back to the people I worked with in 2015 to create programs in both regions that would reflect what women want to see and experience at the Show. It’s as if we are meeting all over again, with a better understanding of where we stand in the river as individual anglers, and as a member of an under-represented group in the industry. And we all have fabulous ideas of how to answer more questions, provide more information to the industry and use the momentum gained from the Showcase to improve the visibility and numbers of lifelong female anglers. I have spent endless hours brainstorming with Kelly Buchta, Jackie Jordan, Peggy Brenner, Andrea Lyn Van Benschoten, Cathy Beck, Sheila Hassan, Cathi Comar and more. Sure, Joan Wulff is irrefutably making us correct her silhouette’s line on our logo, and Cathy may only be in Somerset one day of the weekend, but the Show will go on, and the Showcase will continue to improve and innovate year after year. And even on days when I haven’t slept the night before, I can’t remember when I took my last shower and I am, once again, spoon feeding my sick child Ramen (because that’s all he would eat), I will continue to enjoy the creativity and the community I get out of being the Project Coordinator for the Showcase. In the end, I have to throw it all back to the original creator of the Fly Fishing Show, Chuck Furimsky. That man has a pulse on the industry like no other, and I will always be grateful that he suggested we start a Women’s Showcase in 2015. Thanks Chuck! The list of things to do is long. On rough days, we call this daunting, overwhelming, consuming, and stressful. We have been paying for a rented office space for almost three weeks and have yet to stock the space with survival snacks and beverages. Because the building is old, and encumbered by snow most of the year (Crested Butte gets an average of 200 inches of snow each winter), the wiring has gone bad and despite several attempts by CenturyLink to remedy the problem, we have no functional phone line or wireless internet. Especially on days that you’ve offered to dog sit but won’t be home all day because you’ve got your car in the shop for repair. You’re wearing a backpack and walking a mile between the dealer and the coffee shop. You’ve bought your obligatory egg and cheese bagel because you should purchase something while using the wifi. You stop at Family Dollar to buy an umbrella because the one you already one is “stored” in an undisclosed location in the van, along with your good rain jacket and rain pants. You’ve left your phone charger in the car so you can’t “waste” battery power making work calls. 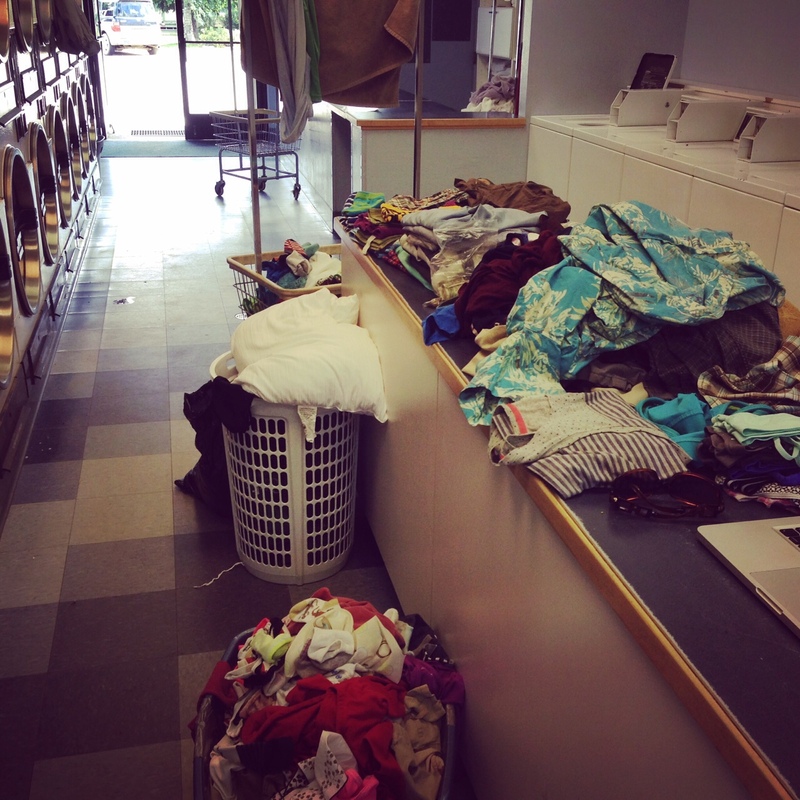 You are still thinking about your lost work day this week when you hauled 7 bags of laundry to the hostel because you couldn’t fathom washing pee pee pillows, quilts, fishing bags, stuffed animals and drawers full of clothes in your own laundry room and then working the clothesline for days on end. On days like these, you need inspiration. If I could sell a few books, confirm a few sponsors and schedule posts for next week, that would make me feel pretty darn good. I have a new umbrella, a cup of coffee and my computer charger. Wish me luck. My house is not immaculate. It is not even tidy. I am sure my mother-in-law would not dare call it clean. But, on the weekend, the last thing my family and I want to do is clean the house. We use the weekends to recreate. We boat, fish, camp, hike and adventure in the mountains and waters around Colorado with our two year old son, who will never know what nature deficit disorder is. Reality sets in on the drive home late Sunday night. I close my eyes and let my husband drive us over two mountain passes and I beg sleep to provide reprieve from the stress closing in. There are numerous dirty piles of clothes and linens on the laundry room floor; the dishwasher is full of dirty dishes..but at least my husband fixed it before we left on Friday. Sorry about those miscellaneous items wedged between the cabinet and dishwasher. I thought I had lost that travel food masher! We arrive home 6 hours later than my mind’s hopeful plan. Sleep comes easy. We’ve played hard out there in the wilderness. On Monday mornings, we “front” the work and school week ahead of us. My son wakes an hour earlier…giving us enough time to spend the first twenty minutes in the dark of his room, snuggling the sleep away and the next twenty minutes soaking in the tub, cleaning the dirt out from our finger and toe nails and scrubbing away the river water from his “toe head” hair. I am at a stage in my life, where “I need a new bra,” “The kitchen floor really needs to be scrubbed,” and “There is a really cool free event in town this weekend” are not my statements of priority. Before I sat down to write this, I kissed my husband and told him that I loved him. He doesn’t care that we don’t have a clean house. We would prefer sun-kissed days during these last few weeks of summer before mud season and winter set in. This page is going to be what it is. I hope to spend a few hours here and there enjoying a hobby that I have been missing in my life- writing. On days that I am out on the water fishing with my husband and son, fleeting thoughts cross my mind and I want to collect them and share them. Maybe a situation is so laughable I have to share it with someone. Fishing Tenkara with a 25 lb boy on your back and navigating through endless willows along Cement Creek. Attempting to rig an umbrella on a Riverworks boat frame to provide my son solace from the piercing Colorado mid-day sun. Chasing lions and building fairy houses around campgrounds in the middle of the Gunnison National Forest. So, here’s the place. Now’s the time.